Recently, my fiance and I planned a trip to Playa del Carmen, Mexico and after weeks of planning and excitement we found out that my stepdaughter's school was having a formal Valentine's Day dance. We felt awful but explained that, unfortunately, things like this happen. She understood and was really great about it. 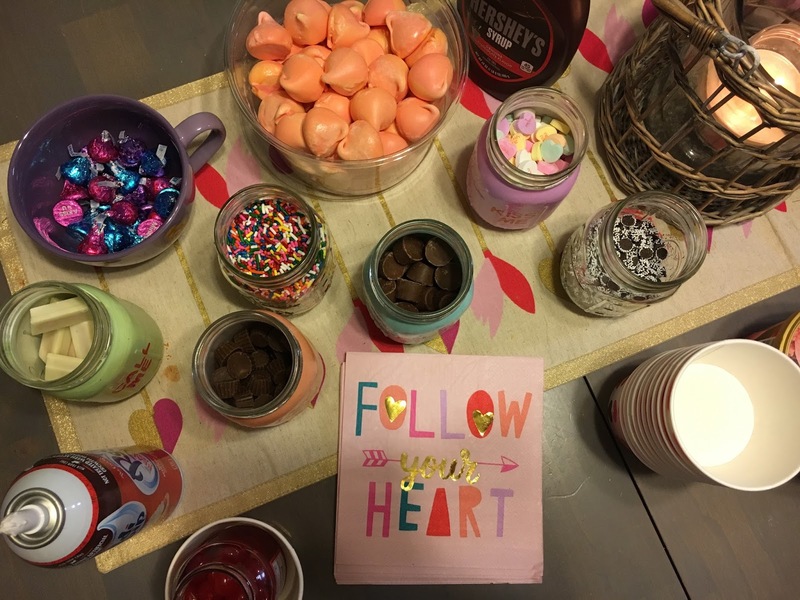 She was mature and super cool and we rewarded her by allowing her to plan a Valentine's themed sleepover party for all the girls in her class! We made glitter-heart invitations, we made heart-shaped pizza crust for decorating your own pizzas, we decorated with so much confetti I think I will still be finding it after my mortgage is paid off! Everyone's favorite part, however, was the ice cream sundae bar! We got everything we needed at BJ's Wholesale Club and Dollar General. We got an assortment of $1 candies as well as Valentine's specialties like conversation hearts, white chocolate/red velvet kit kats, meringues, and found super cute paper goods at Target! Best Part??? EVERYTHING WAS SUPER CHEAP BECAUSE WE PLANNED OUR PARTY FOR THE WEEK AFTER THE HOLIDAY!